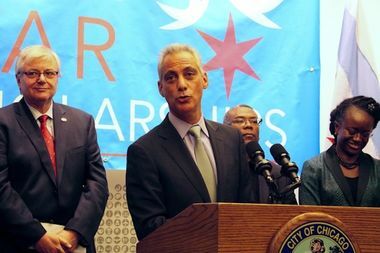 Flanked by Chancellors Michael Amiridis of UIC and Cheryl Hyman of City Colleges, Mayor Rahm Emanuel touts a new scholarship program for CPS grads. CHICAGO — The City Colleges of Chicago will continue to welcome — and protect — students regardless of their immigration status, officials said Thursday. The City Colleges board of trustees is expected to vote Thursday on a measure that prohibits "any discrimination or harassment at City Colleges on the basis of immigration status," according to a statement from the mayor's office. Mayor Rahm Emanuel has said Chicago will remain a sanctuary city despite President-elect Donald Trump's promise to withhold federal funds from municipalities that protect undocumented immigrants from deportation. Trump made immigration a central issue of the presidential campaign. He has vowed to build a wall between the U.S. and Mexico, to deport 11 million undocumented immigrants and to ban Muslims from entering the United States. In addition, the president-elect vowed to impose financial penalties on sanctuary cities that shelter undocumented immigrants. There are 37 sanctuary cities in the United States. In the wake of Trump's election, Emanuel has frequently touted the Chicago Star Scholarship program, which gives Chicago Public Schools students graduating with at least a 3.0 grade-point average free rides to the seven City Colleges. Those scholarships — which Emanuel has touted as a "ticket to the middle class" — are available to students regardless of their immigration status, officials said. City officials are expected to establish a municipal identification card for undocumented immigrants next year.